Daisy Chain Book Reviews: Reviewed by Arianne: Take Back the Skies by Lucy Saxon. 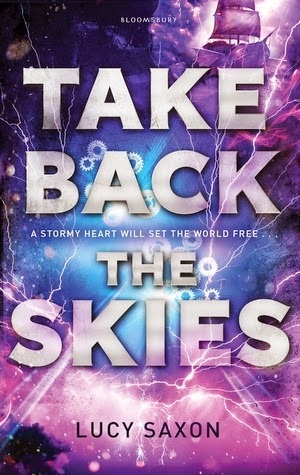 Reviewed by Arianne: Take Back the Skies by Lucy Saxon. Release date: June 5th 2014. Take Back the Skies is a fantastically promising debut. Arriving in a veritable thunderstorm of hype and publicity, it’s a hugely ambitious and imaginative achievement by Bloomsbury's latest teenage signing, with a concept that is literally out of this world. In a parallel universe full of skyships and storm fronts, young Catherine Hunter longs to leave the privileged, suffocating life her father has planned out for her. Just as he’s about to force her to marry a boy she detests, Catherine sees her chance to escape – and she takes it. Masquerading as a refugee fleeing the Collections (think the Hunger Games’ Reaping but this time it’s not a lottery and no one ever comes home) she stows away on a vessel bound for a distant land, praying she won’t be thrown overboard when she’s found - and she’s in luck. She’s discovered by the mysterious, sarcastic Fox, who decides her offence isn’t quite worthy of the gallows. After facing and surviving the surprisingly pleasant wrath of the ship‘s crew, Catherine’s allowed to stick around so long as she learns the ropes. And so Catherine becomes Cat (in the words of the captain, the place is turning into a menagerie) and casts herself in a new image: one of daring, discovery and adventure. Take Back the Skies is one of those great stories that's so good it feels much shorter than it really is. Whole chapters sail by in a furore of Cat’s exploits, helped immensely by a short timeframe and reminders of the price on our runaway voyager’s head (one declared by her own father, no less!). Unveiled in true, glorious steampunk style – if you can stick with the set-up and backstory in the opening few pages - the plot is a rollercoaster with twists you’ll never even see coming. There are government conspiracies and family secrets galore to be uncovered. And the ending! I can’t say much here, but I will say that it’s worth the wait – and that it will make you want to get your hands on more of this story world as soon as you can. Catherine is, theoretically, a dream narrator. She embodies the kind of spirited young character everyone in publishing’s looking for nowadays; one capable of leading the next big series and of connecting with the reader. She’s brave and she’s resourceful, but unfortunately, she’s just a little too cookie-cutter for me. She doesn’t evolve. She knows exactly what to do and when to do it and she never, ever makes mistakes. The best protagonists are often some of the most complex characters in the narrative but as a heroine, Catherine slips between dimensions, falling flat just when you’ve got your hopes up that she’s about to become real. Thankfully, the day is saved by a stellar supporting cast. Fox is fabulous. You’re never really sure what’s going on with him, but he values loyalty and he’s incredibly resilient. Ben and Matt, who alternately pilot and fix up the skyship, provide a strong backbone to a skeleton crew which is led by the incomparable, unmistakable Harry. His wife Alice is given a somewhat traditional role, but even part-time smugglers need a mother figure now and again. Readers will be surprised by the involvement of a certain royal family in proceedings, while Cat’s diabolical father Nathaniel is absolutely rotten to the core. I only had one major problem with Take Back the Skies, and that was the dialogue. It’s not something one usually stops to ponder in a book of this calibre and style, but it was one element of the writing that I felt let me down. Not because the conversational order of the day typically consists of tech-talk and references to imaginary countries (that actually helps make the book more memorable) but because there’s just no flow. In particular, it’s brimming over with dialogue tags. They’re unnecessary and hinder the reader where they should be invisible. To quote the tags of just one mid-story conversation*: ‘she hissed’, ‘she asked’, ‘he replied’, ‘she assured’, ‘Cat cursed’, ‘Fox muttered’, ‘Cat exclaimed’, ‘she screamed’ and ‘she argued’. These appear over the course of about a page and a half and it continues throughout. Everything’s extra-cool or hopelessly dramatic or pulled straight out of a bad movie, and it’s even more disappointing because it could all have been fixed by one bus journey with earphones in but no music on. If there’s anything to be learned from Take Back the Skies, it’s that even when you’re writing fantasy, you can never overestimate the value of understanding how people tick and listening to the way they speak. That said, I must stress that I really did enjoy the book, so I'll certainly be coming back for more from this world and from this admirable young author. I can't wait for the sequel! In short: With a concept reminiscent of Stardust by Neil Gaiman or The Golden Compass by Philip Pullman, Take Back the Skies is an entertaining, page-turning read full of epic-scale adventure and swashbuckling action. It’s not perfect, but it’s pure escapist drama and highly recommended for younger YA readers, so I’m giving it four stars. Great review, Arianne! I'm looking forward to checking this one out. This is the most positive review I've seen of this book and you've given me hope that I might enjoy it too! I've seen a lot of hit and miss reviews for this one myself, but I'm a firm believer in looking on the bright side and Take Back the Skies does have a lot going for it, so I really hope you enjoy once you get around to reading, Mands! I'm so glad you enjoyed the review, Melissa :) The story is the best part of the book - it's action-packed and full of twists I didn't see coming - but the clunky dialogue was a definite distraction. Reliance on dialogue tags, like the formal and derivative writing style also seen in Take Back the Skies, is a common debut author mistake, so I was kind of surprised that a publishing giant like Bloomsbury didn't pick up on it during the editing stage. Other than that though, it's a really great read! I've been on the lookout for this book. The concept is interesting, but Cat seems a little too cookie cutter for me. I think I'll hold off on reading this book for now. Great review, Arianne! Reviewed by Liz: Sister Assassin by Kiersten White. Guest Post: Kiss, Date, Love, Hate author Luisa Plaja talks Film & Filmmaking in YA. Guest Post: An Armchair Medium's Guide to Scrying by The House of Velvet and Glass author Katherine Howe. Where The Dead Fall M J Lee. Blog tour review.